What does ISO 22241 compliant mean? ISO 2224 is a standard prepared by the Technical Committee ISO/TC 22 that often undertakes road vehicles, Subcommittee SC 5, Engine tests. This standard focuses mainly on the handling and storage of Diesel exhaust fluid in a DEF fluid dispenser. The recommended standard laid out in the ISO 22241 document is necessary to preserve the specified quality of diesel exhaust fluid from any point of production to the point where it is filled into the on-board tank of the vehicle. 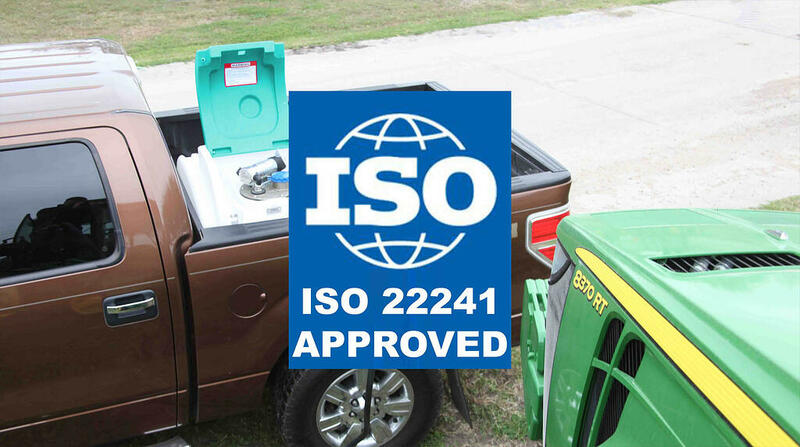 In review, ISO 22241 compliant means the DEF fluid dispenser you are using must be designed to keep the diesel exhaust fluid pure preventing damage being caused to your engine. What is the advantage of having a DEF fluid dispenser that is ISO 22241 compliant? Now you understand what it means to comply with the ISO 22241 standard, it is important to identify the key advantages of having the right DEF fluid dispenser. Section 4 of the standard states, "To avoid contamination of DEF and to resist corrosion of the devices used (containers, tubes, valves, fittings, gaskets, hoses, DEF fluid Dispenser, etc. ), all materials in direct contact with DEF during handling, transportation and storage, including sampling, shall be compatible with diesel exhaust fluid". This means that your DEF fluid dispenser tank components should only be constructed from polyethylene or stainless steel. The key advantage of owning a DEF fluid dispenser that is made to the right specifications is, it will clearly last longer and keep the engines of your expensive machinery in good working order. It is worth looking after your equipment and not risking damage you can't fix.